Robin Hood's Stride, also known as Grain Tor or The Mock Beggars Mansion, because of its silhouette and the appearance of having two chimneys, stands on the Old Portway on Harthill Moor. It's current and more popular name isn't connected with the outlaw but rather the green man who stood astride the two pinnacles of the outcrop and urinated into the fields below. Nine Maidens were dancing in the fields and were turned to stone as a result of this, the stones of the Nine Stone close were once named the Grey Ladies. Surrounded by monuments and settlements of the Neolithic, Bronze and Iron Ages (in the Romano-British period the outcrop was enclosed by a double faced wall) this tor remained a significant place for millenia. 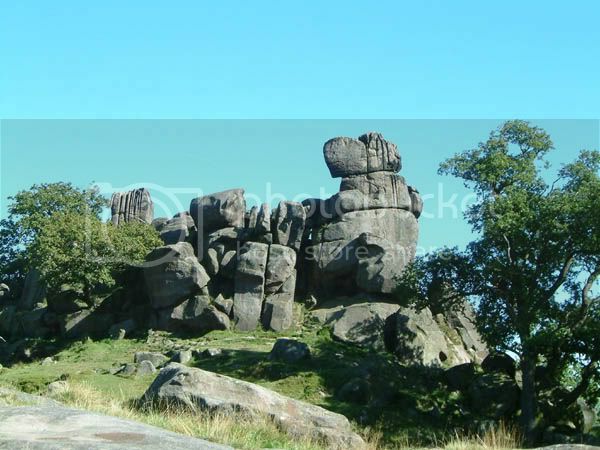 Proto-temple, a natural monument before man-made ones were constructed, is a term that is applied to a number of outcrops, rocks and glacial erratics around the country and Robin Hood's Stride must be counted amongst them for the following reasons. Firstly, it stands on the Old Portway, an ancient track that crosses the limestone plateau of the White Peak from Derby in the south to Mam Tor (and beyond) in the north. The large number of prehistoric monuments this track passes by surely indicates it's ancient origins. 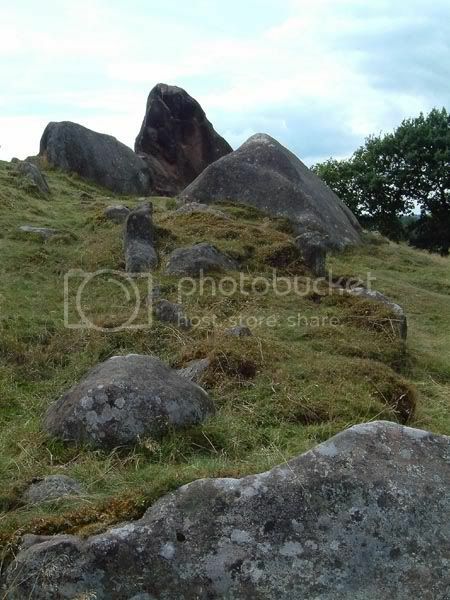 Secondly, the stone circle of Nine Stones close that is located in the fields below the rocks. John Barnatt suggested Neolithic origins for this stone circles because of the near-by enclosure, on Cratcliffe Rocks, of this date and the size of the stones used in the circle. To further back this up the midsummer moons maximum is framed between the two 'chimneys' of the tor when viewed from the circle. Also strengthening this alignment is the presence of several cup marks on one of the circle's stones respecting this more ancient of places. Above: Robin Hood's Stride from the north. Below: Remains of the boulder wall, the large stones in the background were once incorporated into it.